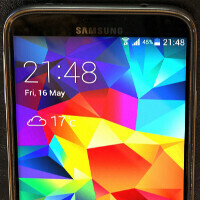 One of our loyal readers has just sent us three pictures allegedly showing off the Samsung Galaxy S5 Prime. The premium version of Samsung's flagship handset is rumored to be coming next month with a 5.2 inch, 1440 x 2560 resolution display. The manufacturer hopes to beat LG to the punch in the U.S., as the latter plans on offering a QHD screen for the LG G3. Other expected upgrades to the device, compared to the Samsung Galaxy S5, include the use of a quad-core Snapdragon 805 CPU as opposed to the Snapdragon 801 CPU employed on the regular version of the handset. The Adreno 330 GPU on the regular version of the phone, is replaced with the Adreno 420 GPU. And instead of the 2GB of RAM found on the Galaxy S5, the Galaxy S5 Prime will feature 3GB of RAM. There is talk that Android 4.4.3 will be pre-installed on the unit. Besides the QHD screen and the other changes, the Samsung Galaxy S5 Prime is made with an aluminum body. The speaker has been moved to the bottom of the phone from the back. Many out there will tell you that this is the phone that Samsung should have released originally. And while the average Joe on the street might not care, there is bound to be negative feedback from some Samsung Galaxy S5 buyers, who would have rather used up their upgrade to buy a premium version of the phone. How Samsung addresses this issue, if indeed it does, should be quite interesting. As for the pictures below, we would suggest that you take them with the proverbial grain of salt. That is not to say that you're not looking at the Samsung Galaxy S5 Prime, but we should be respectful of the fact that the phone has not yet been announced by the company. Our source tells us that the phone is currently undergoing testing. I love those thin bezels, and am glad they moved the speaker back to the bottom of the phone, just like in the note 3. I hope it is an AMOLED QHD display. I love high res OLED screens. I don't know what the side metal is made out of but It looks like some kind of cheap metal. Like the same one on the note 1 that's not even metal. Samsung is loosing their magic, thinking they could sell us crap like this. They feel as if they don't have to do anything because of their dominance in the smartphone market. Apple strategy a few years back. It's made from cheap junk metal where the iphone is made from expensive quality metal. Yea cheap aluminum where the iPhone uses platinum and titanium. More UGLY Samsung phones that will never sell. Period. IF you're so obsessed with ugly, and also apparently a WP fanboy. How about asking Microsoft to fix WP? Talk about an ugly operating system, with no real possibility for the users to even fix it themselves. I really don't get what Microsoft are thinking with WP. They've gotten the de facto desktop OS standard today, much thanks to its customisability, and when they decide to start competing with Android, they opt for copying Apple's locked down operating system which is clearly losing out strong to Android. Hopefully Microsoft will figure it out one day. But until then, I'm definitely keeping a distance. Dont know.. It stil looks ugly to me!! I agree - how can Samsung call this their "prime" version, yet still keep that hideous dimpled back? Yuck. 1. From the looks of it the back is removable; replace it with anything you want. 2. With a removable back comes a user replaceable battery. I don't see Samsung dumping that feature. 3. Buy a case or buy a different phone. Pretty simple. And how does that change what sipha has said? I guess Samsung is using the word "prime" like in "prime rib": As per Wikipedia: While historically known as a “prime rib”, the USDA does not require the cut "to be derived from USDA Prime grade beef". The S5 Prime Rib is not cut from Prime grade cell phone material, that is for sure. Mate How do you know its aluminum? It can be fake plastic also. Its not that I'm trolling but Note 1 has steel like plastic bezels. Hope you take this in a positive note. ummmm....because the article says so.... Although everything at this point in time is just speculation. Thin bezel ?! Are looking at the same pictures ?! After being spoiled by g2 g3. Thin bezels have been redefined. Guys look at those pix more carefully. They seem to be photoshopped to me. It appears that it's an S5 with some sort of bumper or case on it and the display is photoshopped to look larger. Something just does not seem right here. I am very skeptical now after I looked at the first and especially second pic. IDK.